A Dutch security official meant to protect anti-Islam politician Geert Wilders has been arrested on suspicion of leaking his location to a Moroccan criminal gang. Police said the official was of Moroccan descent but not a bodyguard. 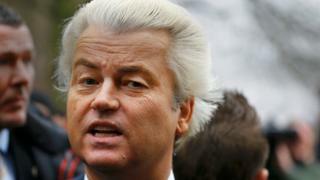 Mr Wilders, who has called some Moroccans "scum", told Prime Minister Mark Rutte the breach was "unacceptable". Opinion polls suggest Mr Wilders' populist Freedom Party could win most seats in next month's election. The officer from the DBB security team was detained on Monday for "sharing classified police information in the private sphere", police spokesman Dennis Janus confirmed to the Associated Press news agency. The DBB is responsible for security around the Dutch royal family, diplomats and high profile politicians, like Mr Wilders, based in the Netherlands. Local media, citing security sources, said the information was being passed to a Dutch-Moroccan gang. Mr Wilders has been under 24-hour police protection for more than a decade, due to death threats. But National Police Chief Erik Akerboom told a Dutch radio station he did not believe Mr Wilders' safety had been compromised, as the officer was not part of the inner circle protecting the politician. However, Mr Wilders, who was found guilty of hate speech over his promise to reduce the number of Moroccans in the country last year, tweeted: "If I can't blindly trust the service (DBB) that has to protect me, I can no longer function. This is unacceptable." Mr Wilders' Freedom Party is expected to do well in Dutch parliamentary elections, but other mainstream parties say they will not join a coalition with the group due to its anti-Islam stance.